Wool for Scuba Diving Enthusiasts! Howey, Hugh. Sand. Broad Reach Publishing, 2014. Buy the e-book omnibus (when did that word stop meaning just 'bus', anyway?) edition here. You know when you're diving, and as you sink slowly down, you feel the pressure start to build, and build, until even just 25 meters down or so, you feel a glimmer of understanding of the essential fragility of human life? Well (Hugh Howey asks), what if you could do the same thing in sand? Meet the eponymous story. The decidedly post-apocalyptic (probably nuclear holocaust in the distant-ish past?) setting of Colorado is covered in mighty dunes, drowned in a dry ocean of sand. The pre-cataclysm world is still reachable, though, to those who have mastered the art of sand-diving, which sounds more or less like scuba diving plus some sophisticated technological telekinesis (divers 'tell' the sand to move with a thought via their special diving suits, and voila! Move it does). And (especially metal) artifacts buried under hundreds of meters of sand are beyond price (which is just a fancy way of saying they're worth a lot) in the crappy new world, which is why divers risk running out of air mid-dive and asphyxiating in the middle of a sand dune, or otherwise expiring during the tremendously dangerous course of a dive. Naturally, there are plenty of important differences to Howey's other work. First of all, this particular story is all about a family, one that has experienced especially harsh swings of fortune from giddy heights to dismal lows, and thus one that (to paraphrase Rick!) is like every other family, only more so. Each of the siblings, as well as certain other family members, seems critically important to this still inchoate quest to right the world's wrongs (though methodologically they take less a Gandhi so much as a (for those of you who know UHF!) "Gandhi 2" approach! ), and I'm quite certain we'll be hearing more about each of them in the (by this reader, at least) eagerly anticipated sequels. As sci fi goes, Sand feels more far-fetched than Wool, in the sense that I can totally believe a) someone might someday build (assuming they haven't already!) some huge silos to save people in the event of a cataclysm, and b) that said cataclysm might someday happen, whereas with Sand, it's harder to speculate what the scientific explanation could be for why the old world's covered in hundreds of meters of sand, or the pseudo-mystical mechanism of the sand-diving suits. Does this greater difficulty in suspending disbelief negatively impact one's enjoyment of the story? Not really—after all, sand-diving is such a cool idea I'm prepared to let Howey run with the concept, however wacky, and that's partly because (in this ever-more-complicated metaphor) Howey is such a good runner! Stylistically, that is, Howey only appears to be getting even better, with great dialogue, and sporadically wonderful descriptions (sometimes of a strange and lyrical beauty, like Tolkien pared down to Hemingway-level pithiness). 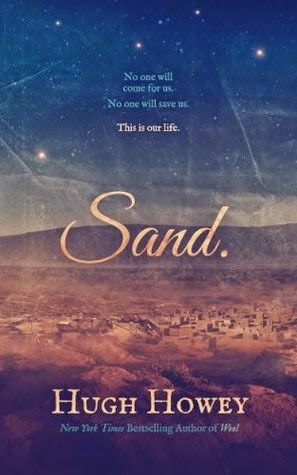 So, the bottom line: is Sand worth reading? Absolutely, for anyone who has the slightest interest in post-apocalyptic fiction (and quite a wide range of others, I would imagine!). Is Sand better than Wool? Not quite, but perhaps that's just the first bite is sweetest problem: if you find a great bakery (or wherever) and sink your teeth into a fantastic cake (or whatever), better than practically anything you've ever tasted in all of cake-dom, even if the next cake from that same place is just as good or even better, how can it really compete with that first endorphin rush? The opinions elucidated herein are solely those of Zhaoyun, sf/f nerd-junkie extraordinaire and Opinionator at Nerds of a Feather since 2013, and should not be taken to reflect the views of Nerds of a Feather's megacorporation owner (everybody's got some (corporate)body, am I right?) or its fat-cat investors, or indeed anyone else in the entire world except those rare few with the same taste as yours truly.